After running a successful pilot program in 13 schools, Corpus Christi Independent School District (CCISD) is expanding the use of two online reading intervention programs from Scientific Learning to all 37 elementary schools for this semester. The Fast ForWord and Reading Assistant reading interventions use research-based tools to help uncover the root cause of reading issues. In order to advance literacy skills, Fast ForWord “starts with cognitive skills like memory, attention and processing speed and works from the bottom up, using the principles of neuroplasticity,” according to a prepared statement from Scientific Learning. The program aims to strengthen neuroplasticity, or the brain’s ability to retain information and learn, with a targeted workout for the brain. The program simultaneously works on building up English language skills with cognitive skills (i.e. memory, attention, processing). Fast ForWord sets each student on a differentiated learning path based on age and assessment results, adapting to the learner as they progress. Teachers can receive graphical reports on how each student is progressing. District officials can also see the reports to know how schools are progressing. The Reading Assistant is an online reading tutor that provides students with more individualized instruction. The tool uses speech recognition technology to support students as they read aloud. A student can, for example, first preview the text silently or listen to a model reading the text. Next, the Reading Assistant “listens” to the student as they read the text aloud, intervening to fix pronunciation or grammar when necessary. In 2013, CCISD implemented Fast ForWord and Reading Assistant in 13 schools, focusing first on English language learners (ELLs) and then extending the program to include all struggling readers. The district reported seeing students making reading level gains of eight months in 73 days of using the interventions. “Our implementation model has worked extremely well, and student usage of the Fast ForWord and Reading Assistant programs is now much more consistent. As a result, we’re seeing major gains in students’ skills and in closing performance gaps,” Maria Luisa Guerra, deputy superintendent for CCISD, said in a statement. 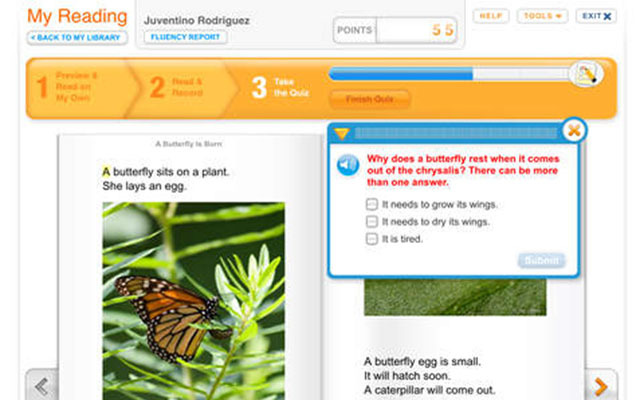 According to a statement from Scientific Learning, CCISD has set a goal of having each student complete at least two Fast ForWord products per year, after which the students will use the Reading Assistant to help build fluency and comprehension. To learn more, watch the video demonstration below. Further information is available on the Scientific Learning site.